^ "Find A County". National Association of Counties. Archived from the original on September 2, 2012. Retrieved April 7, 2012. ^ "Alabama History Timeline, 1701–1800". Alabama Department of Archives and History. Retrieved May 18, 2009. ^ a b c d e National Association of Counties. "NACo – Find a county". Archived from the original on March 9, 2008. Retrieved April 30, 2008. ^ "Alabama History Timeline, 1801–1860". Alabama Department of Archives and History. Retrieved May 18, 2009. ^ "Alabama Counties: Cherokee". Alabama Department of Archives and History. Retrieved December 29, 2008. ^ "American FactFinder". U.S. Census Bureau. Retrieved March 13, 2011. ^ "2010 Census U.S. Gazetteer Files". U.S. Census Bureau. Retrieved March 13, 2011. ^ Nicholson, David. "Alabama License Plates, 1969–present". License Plates of North America, 1969–present. Retrieved August 8, 2007. ^ "EPA County FIPS Code Listing". EPA.gov. Archived from the original on October 8, 2012. Retrieved February 23, 2008. ^ Nicholson, David. "Alabama County Codes". License Plates of North America, 1969–present. Retrieved May 25, 2009. ^ Owen, Thomas McAdory; Owen, Marie Bankhead (1921). History of Alabama and Dictionary of Alabama Biography. Chicago: S.J. Clarke Publishing Company. 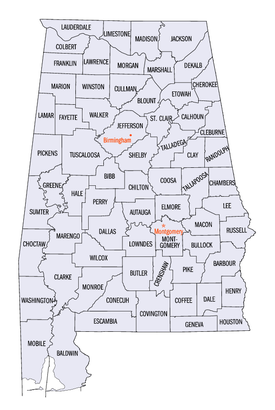 ^ "Alabama Counties". Alabama Department of Archives and History. Retrieved June 1, 2009. ^ a b c "Community Facts". U.S. Census Bureau. Retrieved August 9, 2017. ^ Coffee County, Alabama. "History of Coffee County". Archived from the original on October 27, 2011. Retrieved August 19, 2011. ^ McDonald, William Lindsey (2003) . A Walk Through the Past: People and Places of Florence and Lauderdale County, Alabama. Killen, Alabama: Bluewater Publications. pp. 223–224. ISBN 9780971994560. Retrieved May 8, 2012. "CountyState.info Alabama". Official County Websites. Retrieved September 13, 2007. Map series showing evolution of county boundaries. Cartographic Research Laboratory. University of Alabama Department of Geography. This page was last edited on 17 October 2018, at 00:19 (UTC).